Hello 6P! I’m sorry I haven’t written much lately. I’ve been devoting most of my time to testing, and haven’t put much time online. So, the night before Provincials, I’m facing a dilemma. Should I play a 4-3-3-1 Gengar SF line and a 1-0-1 Nidoqueen RR line, or, play a 4-2-3-1 Gengar SF line with a 1-1-1 Nidoqueen RR line. I asked the UG staff for help, and Cabd said to play a 4-3-3-1 Gengar line and a 1-1-1 Nidoqueen line. I don’t have a ton of room, and don’t want to go over the 24 Pokémon limit. His suggestion proved correct though, as later I would succumb to this decision I made. I also considered adding in a Froslass GL, but I thought it wouldn’t come in handy. ANOTHER bad decision. I end up going with the 1-0-1 Nidoqueen line. 26 Seniors, 5 Rounds, Top Cut Of 4. This guy was really nice. He said it was his second tournament, and that he was hoping to have fun. I start Spiritomb with Psychic and Pokémon Collector in hand. He benches a bunch of random basics such as Togepi, Growlithe, Magmar etc… I draw the first prize my 3rd turn after “Shadow Room”ing his Magmar twice plus a Flash Bite. By the time I’ve drawn 3 prize cards, he has set up a Tangrowth CL and knocks out my Gengar with “Grind” I flip heads on “Fainting Spell” and proceed to clean up with Nidoqueen’s “Ruthless Tail.” I have 1 Prize card remaining when he stalls with Mime Jr. CL, but he wakes up and I knock it out FTW! At this point, I’ve got 2 Prize cards remaining with 4 Pokémon in my Lost Zone. He gets a Gengar SF out, and Shadow Rooms my Gengar LV.X I drop another Crobat G, and KO his Azelf. He does yet another “Shadow Room” on my Gengar LV.X I “Shadow Room” his Gengar SF. He promotes his Gengar Prime, and uses “Cursed Droplets” to send my Gengar to the Lost Zone. I can’t get the KO that turn so pass, expecting the Lost World and the loss. He is unable to get his Lost World though, so next turn I get a Gengar and KO his Gengar SF! GG! After reading up on past city reports, I wanted to be sure I could outplay G-dos. This is part of what led me to choose this deck. I start with a Crobat G and Gastly, and get the turn 1 Gengar with Rare Candy and Psychic. I start to take prizes off all the pixies he’s playing, and he takes a long time to finally get out 2 G-dos. Me and my dad walk to Subway to get a sandwich. Nathan tells me he thinks I can make top 4. I tell him I probably wont and am just here to have fun, not to win. We talk for a bit more, and then we talk to Nevoh who is having the worst luck with starts. He either starts Regirock or Spiritomb with nothing good in hand. He thinks I’m playing Vilegar so doesn’t bother to set up his Vileplume. We both set up Nidoqueen though, but I have Crobat G, giving me the advantage. We start the Gengar exchange, which is the most boring mirror ever, but a misplay can cost you it. At one point when we have about 10 minutes remaining, he sends up his Spiritomb so he can “Darkness Grace” to evolve his Haunter. I use my Azelf’s “Lock Up” on it and it creates a nice little infinite lock because of his Nidoqueen. With about three minutes left, he draws a Warp Energy and KO’s my benched Gengar. Time is called and I’m turn 0 and leading by a prize. I “Flash Bite” and “Shadow Room” for the KO on his Spiritomb. He decides to “Shadow Room” my benched Uxie, a misplay that lost him the game. I Psychic Restore under and he can’t take a prize next turn, so I win! I’m really pumped at this point because I know I can make top 4 no matter what. Nathan congratulates me and the next pairings are up! We have to do deck checks though which led to me getting bad draws. 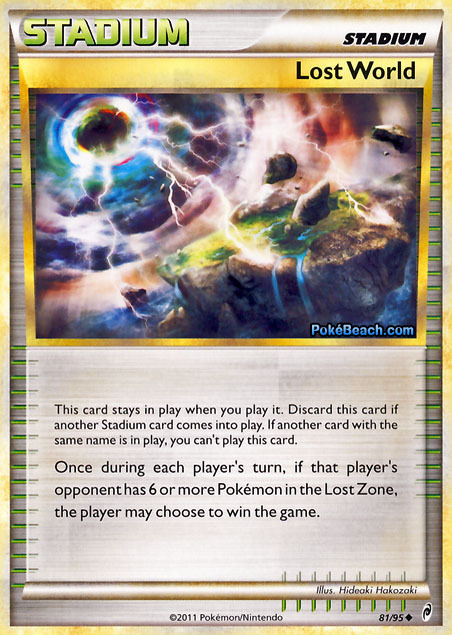 PokeBeachWe both start slowly but he sets up a full Steelix about turn 5. I take a Prize off Skuntank G with Gengar, but he KO’s it and I flip tails on Fainting Spell. He Pokémon Reversals a bunch of stuff up and takes 6 Prizes. So, I wait for about an hour, and then I find out I’m second out of top 4. I’m facing my opponent from round 4, which I’m not happy about, now that he knows what my deck is. We both set up fast, but he gets a Vileplume out, single handily winning him the Gengar Exchange because of my inability to play my Nidoqueen. I draw my opening hand and I start with Azelf. He starts with Oddish and goes first. He passes and I hope to top-deck an Energy so I can Donk with “Lock Up” and Expert Belt plus Oddish’s weakness. I wiff it though and he proceeds to steam roll me with a hand full of trainers. So, I end the day happy, but frustrated I didn’t play the 1-1-1 Queen line or Froslass GL. Mr. Mime was a total waste of space, and I only used him once to see if my opponent had Lost World. I had a great time though! Team Card Masters for top-cutting all age divisions! Pulling 4 Mime Jr! in 8 packs! 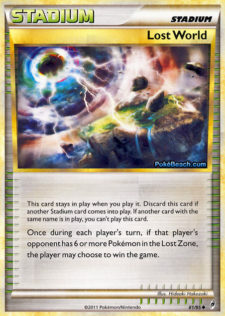 This list works amazing against Vilegar, Shuppet Donk, Dialgachomp and Machamp. 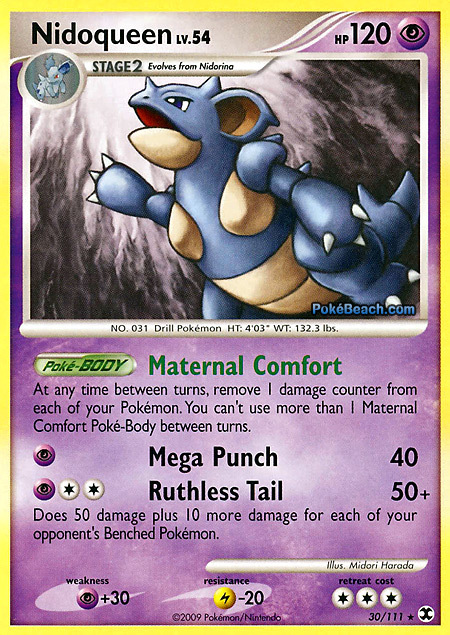 It can use Nidoqueen to take down a bunch of random decks to. Watch out for Lostgar though, it can single handedly destroy this deck. You may even want to tech in a Regice. If you’ve got any questions or comments about my report or list, feel free to post them in the comments! Where was your tournament held? To clarify, i’m not actually UG staff, just a UG member. My hate of 1-0-1 lines stems from my meta, california, with craploads of vileplume variants. That’s why I said to go with the 1-1-1. I know, I asked the UG staff, but members can also respond. I thought our meta would be G-dos heavy, but apparently the G-dos hate turned to Vilegar. I know that YOU know, but non-UG members never saw the post, lol. Unless Adam gave some noob like me a surprise promotion. I know! Its probably my favourite supporter. Theres just so many times when your opponent has a ridiculously good hand, or just Uxie’d, and you Judge it away. Their face is Priceless! Many people say lookers is better because its more versatile, but who cares about that extra card when you can kill 2 birds with 1 stone? Just pointing out the obvious, the correct play is 1-1 Blissey PL. I actually have to disagree. While blissey is certainly the safer play, it is much more one sided. Nidoqueen is also a secondary attacker, and can heal what Blissey can but to every Pokemon. personally i prefer blissey, in part because it helps you empty your hand against vilegar, but thats just me. the choice between blissey and nidoqueen is by no means obvious, and there is definitely no absolute correct play.